Definition - What does Parivrtta Hasta Padangusthasana mean? Parivrtta hasta padangusthasana is a standing yoga posture that involves balancing on one leg. Derived from Sanskrit, parivrtta means "revolved," hasta means "hand," pada means "foot," angusta means "big toe" and asana means "pose." In this pose, the yogi begins in tadasana then lifts the right foot up, holding the outer side of the foot with the left hand. The right leg is stretched straight in front of the body then brought across the body to the left side. The right hand is extended sideways and the gaze is fixed on the extended hand. The pose is held for 20 seconds then repeated on the opposite side. Parivrtta hasta padangusthasana is also known as revolved hand-to-big-toe pose in English. Performing parivrtta hasta padangusthasana requires balance and flexibility. Those with a lower flexibility level can use a yoga strap to hold the foot of the outstretched leg. Parivrtta hasta padangusthasana strengthens the legs, stretches and improves spinal flexibility, opens the hips and strengthens the core. 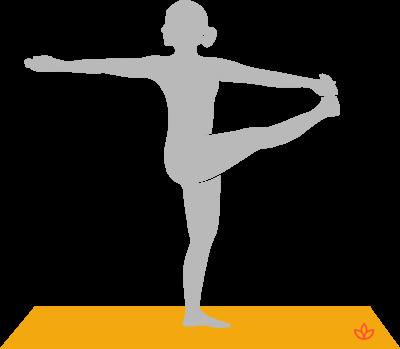 Parivrtta hasta padangusthasana activates the manipura chakra. A balanced manipura chakra promotes peace, self-respect, positive attitude and courage. It also aids in self-motivation, decision-making and boosting confidence.